Can you believe it's April already?! For this card I started with beautiful patterned papers from Blue Fern Studio. 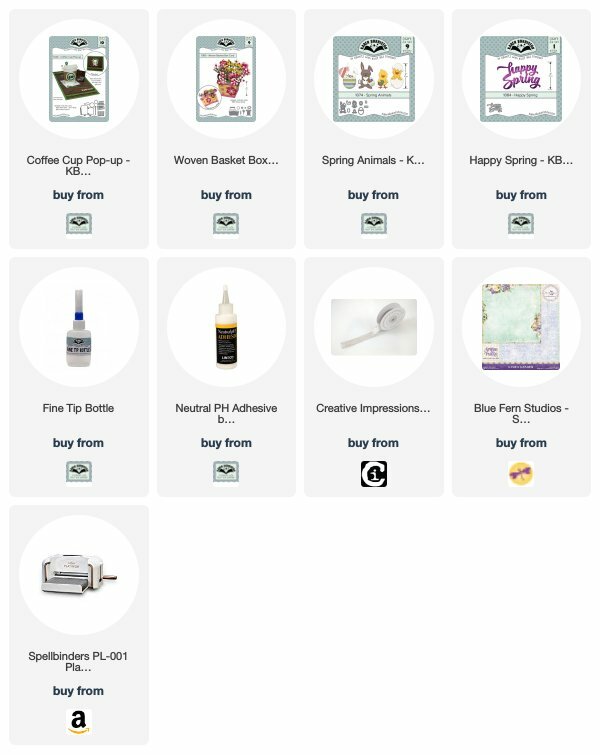 I was able to find a source for the interior design (supplies linked below) but not the outside paper (Spring Parade April Medley). A challenge in our industry among YouTubers and teachers is the short product lifespan of patterned papers. This technique, however, will work wonderfully with any papers. I kept the front simple with just a rectangle of patterned paper and a crepe ribbon bow. The card measures 4.25" x 5.25" when folded. Once open the pop-up woven basket is revealed. By combining the mechanism from the Coffee Cup with the decorator pieces from the Woven Basket a completely different look is achieved. For the greeting block I took inspiration from a card by Helen Cryer where she added a square over the center of the napkin to cover the slots. I strategically placed the Happy Spring greeting to cover the seam between the two napkin halves. To style the bunny I took inspiration from a famous literary rabbit and fashioned a blue jacket from a second cut of the bunny die. The Spring Animals die set comes with an adorable little basket for the bunny to hold, but I wanted him to hold a carrot from the garden. I used the carrot nose from the Snowman die set along with the ostrich's neck feathers from the Feathered Animals (cut in half) to fashion a carrot. One of the things that we tell our Design Team is that family always comes first. This is why you will sometimes find a team member or two on sabbatical as something else needs their full attention. Worry not - they will be back! Many of these talented ladies have been on my design team for nearly a decade, if you can believe it. What a blessing! Please consider giving a click to your favorite cards below and leaving a comment on a blog or two. Everyone loves comments! Karen Aicken styled the cute little chick from the Spring Animals to perfection on this Upsy Daisy Easter card. The colors and details are amazing! Irene Mendes really shows her talent for soft, pretty and elegant combinations with this Twist Panel Easter card. I love her choice to make it a side-fold card with a vertical panel stack. Kelly Booth knows how to style hip Spring Animals. Check out the pink and blue bunnies with sweet white feet! This Upsy Daisy Easter card is sure to delight! Summer Hills-Painter created the perfect Easter scene with this Tag Book creation featuring the Easter Charms. I love how the panels create a beautiful Easter landscape. Frances Byrne has an absolutely darling Oval Frames Pop-up featuring the Spring Animals and Garden Charms. Notice the bunny peeking out of the grass. Adorable! Sandy Diller has been rocking the Woven Basket Box Card. Check out this array of amazing makes. Her Easter basket is bright and full of treats. Then she made a doublewide steampunk basket and a masterpiece large basket for her mother's birthday. Awesome! Lois Bak created this blooming bouquet to celebrate the reason for the season. In my Lutheran upbringing, when the pastor calls out "He is risen!" the congregation responds "He is risen, indeed!" and so naturally I cannot see this card without saying that in my head. What a gorgeous basket. Fran Sabad converted the Frame Pull Pop-up into a waterfall and then created the sweetest story with the Spring Animals. What fresh colors and adorable styling. Another amazing challenge. Join us next month, on May 8, 2019 for our next challenge with a theme of CONGRATS!